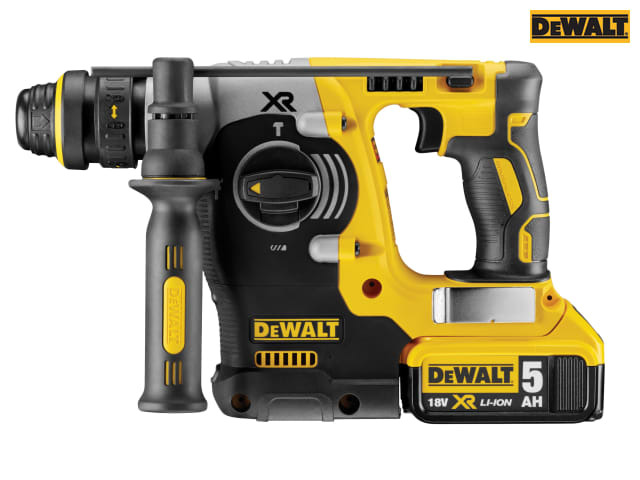 The DEWALT DCH274P2 Brushless XR SDS Plus 3 Mode Hammer is supplied with a quick-release SDS Plus tool holder and keyless chuck for easy switching between hammer/rotary hammer and rotary only applications. It has a category-leading high speed drilling performance at more than 90 holes (10 x 80mm) per charge. With a rotation stop mode for light chiseling in plaster, tiles and render and impact stop mode for rotary only drilling in wood and metal. The brushless motor and high capacity XR 18 Volt 5.0Ah Lithium-Ion battery platform provide extreme run time and reduced maintenance. 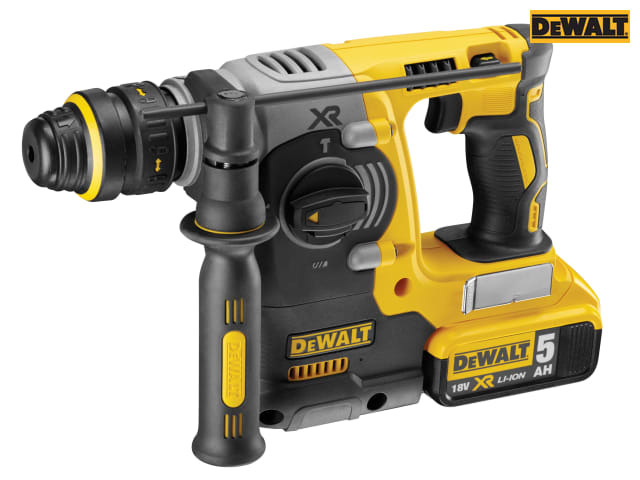 It is fitted with an electronic clutch for consistently-high torque and improved durability and is ideal for drilling anchors and fixing holes into concrete, brick and masonry from 4 to 24mm. Its compact, lightweight and ergonomic design provide improved comfort and support during extended operating periods. It also has a bright white LED with delay feature for improved visibility. Supplied with: 2 x 18v 5.0Ah Li-Ion Batteries, 1 x Multi-Voltage XR Li-Ion Charger, 1 x Belt Hook, 1 x Multi-Position Side Handle, 1 x Quick-Release SDS Plus Tool holder, 1 x Quick Release 13mm 3 Jaw Chuck and 1 x Heavy-Duty KitBox. 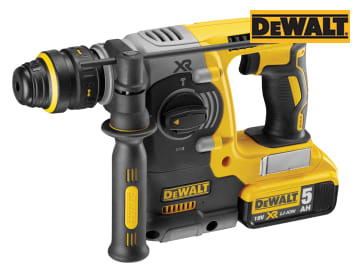 1 x DCH274P2 Brushless XR 3 Mode Hammer 18 Volt. 2 x 18 Volt 5.0Ah Li-Ion Batteries. 1 x Multi-Voltage XR Li-Ion Charger. 1 x Multi-Position Side Handle. 1 x Quick-Release SDS Plus Tool holder. 1 x Quick-Release 13mm 3 Jaw Chuck.